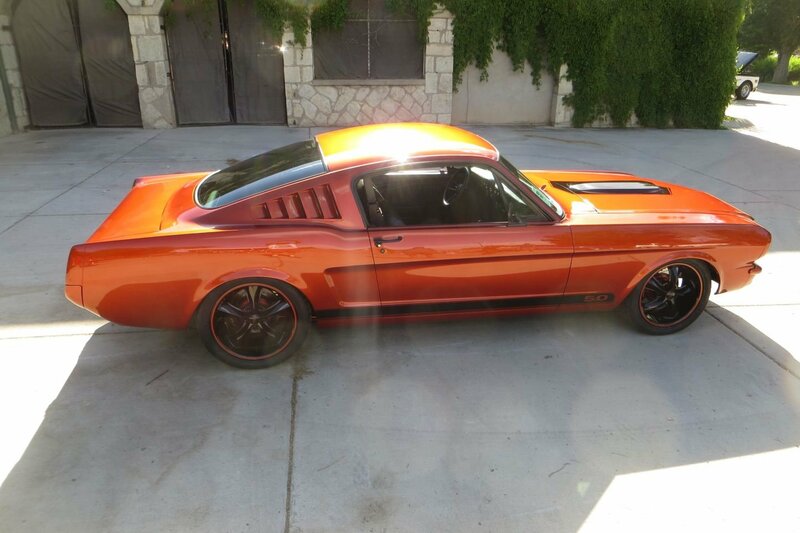 This '65 Mustang Goes From Bare Shell To Striking Coyote! In 2006, Eric Manlove of McAlester, Oklahoma, purchased what was left of a 1965 Mustang. Having searched for 3 years to find a rust-free, complete shell, it finally surfaced on Craigslist in Oklahoma City, 130 miles northwest of his home. Eric didn’t want a complete car, because his ultimate goal was to start from scratch. The shell advertised, had no drivetrain, suspension, or interior, but was perfect for what Eric needed. Eric owned a variety of cars before he retired from the Army after 27 years of service. Eric commented “I don’t get stuck on make, or manufacturer, just buy cars I like.” He’d like to own a ’71 Plymouth Cuda if he ever stumbles across a solid one. For now, we’re sure he’s happy with his Mustang. While he was still in the Army, Eric realized that cars were his most preferred pastime. The first car he acquired after retirement was a 1978 Camaro Z28 that was a black, T-top, four-speed car. He started rebuilding the Camaro in 2013, finished it in 2015, and showed the Camaro for three years at local and national events. The Camaro was show-quality when completed, but around Eric’s home, red and chrome rule. My Camaro couldn’t buy a win at a local car show,” Eric recalled. The engine is a 2014 Ford Racing crate Coyote, that features a Ford Racing Performance Parts control pack and harness. The powerplant made 401 rwhp at 7000 rpm on a Mustang dyno. After losing at shows got tiresome, Eric decided it was time to pull the Mustang out of the old hay barn (literally) and get started. The plan was to create an entirely home-built car that could compete with the locals, as well as the professionals at NSRA and Goodguys shows. From day one, the car was designed and built to be a driven car – logging 8,000 miles in the first year proves it. That includes the latest road trip to the NSRA Rocky Mountain Nationals, on to New Mexico, and then home. Eric says he has no use for trailered cars, and proves it again and again by driving to and from events, while sightseeing on the way. Left: The interior was hand fashioned using stock the seat frames with TMI Sport R foam inserts. Every panel in the car is wrapped in black leather. Right: The hood features a hinge from a late '90s Buick Park Avenue. Most car guys say they “built” their car, but in reality, probably just “assembled” it. Especially when help is needed for wiring, chassis, and engine work, etc. (This author included!) Excluding front-end alignment, Eric does all his own work. His home shop is 30 x 50 feet, equipped with a lathe, Bridgeport mill, Mig and Tig welders, a lift, a home-built paint booth and walking-foot sewing machine. He wants for nothing when building a car. The complete interior and trunk were fabricated and sewn out of six hides of leather by Eric in his home garage. Eric notes the contribution of his good friend, Rudy Hitt. During a three year period, the two built Eric’s Mustang and Rudy’s ’57 Chevy. At times they’d work 7 days a week. Work days started at 9a.m. and ended at 3p.m., so these guys weren’t just sitting back cracking brews. Both cars were sprayed at Rudy’s place, and the interiors were sewn at Eric’s house. The Coyote logo was made up as a jab at Eric’s friends that insist on running LS engines in their cars! Additional acknowledgement belongs to Tandy Thomas, the primary motivation for building Eric’s Mustang to the level you see here. Tandy won every award there was within 100 miles of McAlester for 10 years. Eric would show up in his Camaro and Rudy would bring his black ’57 Chevy Hardtop, but Tandy would “mop the floor “with them. Tandy nicknamed them, “little grasshoppers,” not ready for the big time. So, Eric and Rudy decided to each build a car, specifically to topple the empire. As they completed something on their cars, they’d ask each other if it was good enough. If the answer was yes, it stayed. If the answer was maybe or no, it got a redo! The Mustang you see featured here is a product of that work…several NSRA and Goodguy’s awards prove Eric can build and compete with the best of them. 2014 Ford Racing (FRPP) crate Coyote, 420 hp. FRPP control pack and harness. Completely stock except for the owner-built cold-air-intake. The motor made 401 rwhp at 7000 rpm on a Mustang dyno. Tremec T56 Magnum 6 speed, close ratio. Quicktime bell housing, Ram 11 inch clutch with hydraulic throw-out bearing. 3 ½ inch aluminum drive shaft with 1330 u-joints. Ford Explorer 8.8 rear, narrowed 4 inches. FRPP 4.10 gears, posi, Moser 31-spline axles. Northern cross-flow aluminum radiator with two SPAL fans. Vintage Air Gen IV A/C. Vintage Air front runner power steering A/C compressor mount. Wilwood 12-inch rotors, 4-piston calipers. 2001 Mustang hydra-boost with custom mounting bracket–moved 4-inches outward to clear cylinder head. Offset type brake linkage. Stock 2001 Mustang master cylinder. Wilwood proportioning valve. Modified Heidts Mustang II front, power rack, 2 inch dropped spindles. Owner-built 4-link with panhard bar. 1992 Cougar IRS differential cover utilized as panhard bar mount. RideTech adjustable coilovers, 250 pound springs. Front and rear bumpers filled and tucked. 1966 Shelby GT350 hood scoop. Reverse opening hood, hinge from a late ’90s Buick Park Avenue. Rear hood latches custom made. Underhood panels hand built. Glasurit 55 base. Custom mixed color. Southern Polyurethanes Universal Clear. Four coats of base/3 coats of clear. Dried two weeks and blocked, then sprayed 2 more coats of clear. Cut and buff from there. All stainless and chrome on exterior is satin black powder coat done in a homemade oven. Every panel in the car is wrapped in black leather – dash pad, doors, headliner etc. Seats are stock frames with TMI Sport R foams. Gauges are Speedhut Revolutions in a 6 gauge cluster. GPS speedo. Carpet is ACC Daytona weave. Hand built rear fold down seat. Pioneer stereo. Kicker speakers and amp. Eric's Coyote is gorgeous at any angle. With the Mustang finished and Eric enjoying the fruits of his labor, is there another car Eric wants to build in the near future? Of course! Sticking with Ford products, Eric told us the next one will be a Pro Touring 1964 Comet, with a twin-turbo small-block build.